It’s worth noting that just days before production could begin on Stratton, the adaptation of author Duncan Falconer’s series of books about the titular Special Boat Service operative, star and producer Henry Cavill decided to jump ship, citing the industry-old excuse of “creative differences” as his reasoning for exiting. Dominic Cooper stepped in to replace Cavill in the title role, which probably worked out for the better because Cooper is far more convincing in the role than Cavill ever could be (there’s something about Cavill’s movie-star good-looks that just doesn’t scream “rough and rugged military type”), but let’s consider those “creative differences” for a moment. Either there were some major disagreements with director Simon West about how best to bring this popular character to life, or he left because he realised he was getting into something completely ridiculous, and after Batman v Superman: Dawn of Justice another catastrophic action movie must have been the last thing he wanted to do at the time. Personally, I felt that while Stratton isn’t really a good movie, and there’s quite a bit to talk about regarding what exactly doesn’t work about it, it’s not really as bad as a lot of people are making it out to be. I mean, it’s not good, but at least it has promise for better things in its future – it just happens to be a bit muddled in its first impressions. The overwhelmingly clichéd and generic story sees Cooper’s John Stratton lead a team of operatives on a globe-trotting mission to take down a terrorist cell, fronted by rogue former SBS agent Grigory Barovsky (Thomas Kretschmann) who Stratton wants revenge on for the opening murder of fellow field operative and token American Marty (Tyler Hoechlin). Revenge, however, must take a back seat to Barovsky’s nefarious scheme of releasing a deadly toxin into the London streets via drones and a stolen set of chemicals, which of course Stratton and co must take down before it’s too late. There’s plenty about this movie that doesn’t work, and you can kind of see why Cavill would bail on this movie before production began; it’s the same kind of action-thriller espionage movie that every film outside the James Bond, Bourne and Mission: Impossible series wants to be, only it takes itself far too seriously and presents it most ridiculous plot twists with such a straight poker face that it’s hard to tell if underneath their exteriors the cast are giggling uncontrollably at the material they have been given. Characters and their stories are stereotypes of each other, with Stratton being reprimanded by his boss (Danish actress Connie Nielsen, who acts with one of the most distractingly bad English accents you’ll hear in a film all year) as an insubordinate who doesn’t play by the rules which, outside of the fact that this kind of lead character has existed since the dawn of time, doesn’t make sense because prior to that we’ve seen him follow things pretty closely and without a rebellious streak whatsoever. The twists that this movie presents to us are preposterous and completely void of any sense or logic; a blackmail plot drives a certain character to betrayal, and they kind of become a villain without any real motivation (I’ll give you a clue: it’s the guy in the group who’s pretty known for playing bad guys) or just because the script now dictates that he’s a snarling bad guy. In addition, West – who made his debut with the wildly OTT action film Con Air twenty years ago – is severely lacking in the action scenes here, which just look like cheap recreations of other better put-together films, with a later boat chase eerily identical to the opening from The World Is Not Enough. By most accounts, it’s a pretty dumb movie with such a serious poker face it’s almost laughable. However, there was a small part of me that was enjoying it for the disaster that it kind of is; after a while, I just switched my brain off and just let this stuff happen, and in my own state of absent-minded complacency, I could actually get behind even the dumbest and nonsensical parts. Even when my critic brain was switched on, there were parts of it that were so ill-advised and silly that it becomes unintentionally funny, making it a pretty bad movie that was kind of fun to watch. So, the reason I don’t think it’s nearly as awful as many other people are making it out to be is that, while it is indeed bad, it’s so inept in parts that it’s kind of entertaining to sit down and pick apart. I will also say that despite being a last-minute replacement for Cavill, Cooper really isn’t that bad in this. He’s convincing enough as this hardened tough guy, even though it’s the same kind of hardened tough guy in every other movie, and again is probably a more believable fit for the character than Cavill probably would have been. But even he has to work with material that is so dumb, that it’s almost kind of a hoot to watch as a so-bad-it’s-good movie that drenches itself in endless clichés, and does it all with the straightest of faces that it soon becomes funny. 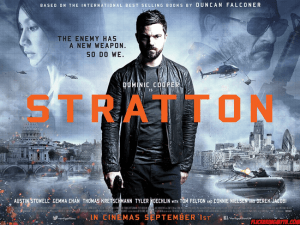 Stratton delivers a pretty rubbish enactment of several action movie clichés all rolled into one, but the result is oddly satisfying in an unintentionally hilarious way that it’s almost worth recommending as a so-bad-it’s-good movie.